Below is an excerpt from the DRECP Record of Decision – Appendix A. The entire Record of Decision can be found here, but it is a long document and maybe not something that you would think would be interesting. Yet the section regarding the Amargosa is a nice summary of the many reasons that this is a special place. Therefore, we are sharing it here. To download the entire Appendix A, click here. We did add pictures and links ourselves; they are not included in the original document. The Kingston-Amargosa subarea is marked by permanent flowing water and wetlands within one of the driest desert regions on the continent. It includes a broad range of habitat types supporting diverse plant and wildlife species including many special-status species; and several narrowly endemic species, some of which may be new to science. Public lands provide critical habitat connections between a number of designated BLM Wilderness Areas such as the Kingston Range, Nopah Range and Funeral Mountains, as well as Death Valley National Park, and the Mojave National Preserve. The subarea includes some of the most intact viewsheds in the California desert and is key to preserving the historical integrity of tribally significant landscapes, and cultural landscapes associated with the Old Spanish National Historic Trail. Nationally significant paleontological resources in the subarea include the Mountain Pass dinosaur trackway, the only known occurrence of fossilized Mesozoic reptile tracks in California and a rare occurrence in the United States. Mountain Pass was designated for protection by Congress and is included in California Desert National Conservation Lands. Existing BLM National Conservation Lands play an important conservation role in the subarea. They have already been designated by Congress for conservation purposes, and they are not subject to the alternatives under this plan. All or portions of the following Wilderness Areas are within the subarea: Kingston Range, Nopah Range, Resting Spring Range, Funeral Mountains, Mesquite, Stateline, North Mesquite, Pahrump Valley, Ibex and South Nopah Range Wilderness. Other National Conservation Lands include the foreground viewshed of the Old Spanish National Historic Trail and the Amargosa Wild and Scenic River. These areas are not managed by the BLM and are part of the California Desert National Conservation Lands but contribute to the habitat conservation goals of the DRECP: Death Valley National Park and the Mojave National Preserve. This alternative would include as California Desert National Conservation Lands the most important wildlife linkages and critical habitat in the subarea, and other lands with ecological sensitivity and natural integrity. These include critical linkages between Wilderness Areas and National Park units and intact landscapes between these large conservation areas. The linkages for wildlife migration are critical to the conservation of species in the East Mojave region, based on their geologic and topographic variability. The migration linkages support both biodiversity and opportunities for adaptation to climate change. Linkages are particularly important for sustaining the genetic integrity for the federally listed Threatened desert tortoise in the southern portion and a significant amount of suitable, intact habitat for desert bighorn sheep, a BLM Special- Status Species, especially in the Shadow Valley and Silurian Valley areas. Ground and surface water from the surrounding mountains, primarily in Nevada, flow into the Amargosa Wild and Scenic River, which supports the endemic Amargosa pupfish and Amargosa Canyon speckled dace, as well as endemic species of spring snails. Known as the “Jewel of the Mojave,” the Amargosa drains into Badwater in Death Valley, the lowest point in the Western Hemisphere, and supports habitat for the Death Valley pupfish. The Amargosa River corridor boasts riparian communities that include riparian galleries of mesquite bosque and cottonwood; and an exceptionally rich bird life (over 300 species being found in the area), including peregrine falcon, snowy plover, and the listed least Bell’s vireo, leading to its national recognition as an Important Bird Area. This area is home to the only population of the federally listed Amargosa vole; the vole’s entire range is included in this subarea’s California Desert National Conservation Lands. 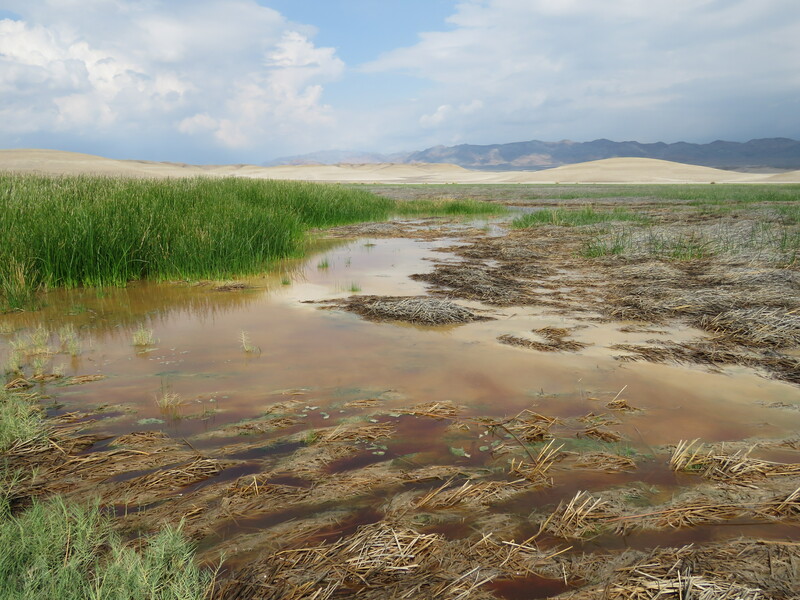 This subarea also includes the northern segment of the Amargosa River and its populations and the entire range of the federally listed Endangered Amargosa niterwort in California Desert National Conservation Lands. The Shoshone Caves, near the town of Shoshone, support a unique assemblage of endemic invertebrates. The caves are included in California Desert National Conservation Lands. The California Desert National Conservation Lands in this ecoregion subarea include a diversity of nationally significant archaeological and historic sites within California Desert National Conservation Lands. Evidence of the earliest inhabitants includes rock art sites, a prehistoric turquoise mine, flakestone quarries, prehistoric and historic trail systems, rock alignments, sleeping rings and other sites that are associated with successful long-term human occupation of one of the harshest environments in the United States. Sites in the Shadow Valley and Silurian Valley areas are of particular importance. Historic mining areas in both valleys are also included. Scientific Values Unique habitat, endemic species and complex hydrology offer many opportunities for scientific research on the California Desert National Conservation Lands in this ecoregion subarea. The endemic Amargosa vole is the subject of long-term demographic, disease and genetics research and offers scientists a unique opportunity to study a relict species from wetter climate periods. The area is currently the focus of validation studies to describe new species including a number of new invertebrates in the Shoshone Caves, as well as the Shoshone whip-scorpion. Other potential species new to science include endemic spring snails in seeps and springs. These lands are also the focus of long-term studies examining the success of habitat restoration for songbirds, including the federally listed least Bell’s vireo and southwestern willow flycatcher. In terms of groundwater supply, the area is part of the vast Death Valley Regional Flow System, which extends from the springs in eastern Death Valley to north of Yucca Mountain and the Nevada National Security Site, and includes Ash Meadows National Wildlife Refuge, Devils Hole, the Spring Mountains, (all in Nevada), and several towns and smaller communities, including Shoshone, Tecopa, and Tecopa Hot Springs; domestic water for all three towns is primarily from springs rather than wells. While the aquifer through which this groundwater flows has received considerable study to the north and east, information is just now being developed for the southern Amargosa and Amargosa Wild and Scenic River. More study is required to understand better the interactions between the spring-fed Amargosa Wild and Scenic River and the regional aquifer, especially in light of climate change. 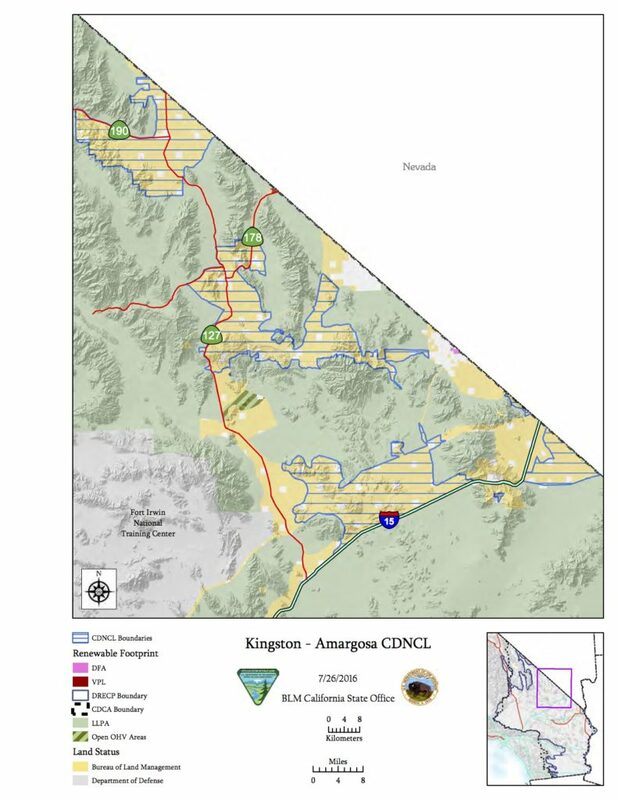 There are approximately 433,000 acres of California Desert National Conservation Lands in the Kingston-Amargosa subarea.